Thiaminases are enzmyes found in a few plants and the raw flesh and viscera of certain fish and shellfish. When ingested these enzymes split thiamin (Vitamin B1), an important compound in energy metabolism, and render it inactive. The following pages detail how thiaminases work metabolically, where they are found, and the effect their ingestion can have and livestock and humans. The conversion of pyruvate to acetyl-CoA catalyzed by pyruvate dehydrogenase. The conversion of alpha-ketogluterate to succinyl-CoA in the TCA cycle catalyzed by alpha-ketogluterate dehydrogenase. The conversion of branched-chain alpha-keto acids to acyl-CoA's catalyzed by branched-chain alpha-ketoacid dehydrogenase. The transfer of a 2C fragment from alpha-keto sugars to aldose acceptors in the pentose-phosphate shunt catalyzed by transketolase. It should be obvious from the above that thiamin is an essential component of energy metablosim. Without sufficient thiamin, animals have impired pyruvate utilization, causing increased plasma pyruvate levels and a shortage of cellular ATP. Thiamin deficient animals also have below normal transketolase activity, and therefore a good test of thiamin status is to test the amount of erythrocyte transketolase activity an animal exhibits. Because thiamin is so essential to energy utilization, general signs of thiamin deficiency include weight loss, impaired feed utilization, and weakness. More defieciency signs are detailed in the pages under Signs/Symptoms of Thiamin Deficiency. Some thiamin is also used to form thiamin triphosphate which is thought to have a function in brain cell viability, though its exact role is still unclear. Natural sources of thiamin include yeasts, meats (especially pork liver), and whole cereal grains. Unfortunately, processing of grains greatly reduces their thiamin content. Thiamin is absorbed through the intestinal wall by both passive diffusion and active, carrier-mediated transport depending on the concentration present. Active transport is highest in the jejunum and ileum, therefore lower gut fermentors that are not corprophagous absorb little of the thiamin produced by intestinal microflora. Ruminants generally have their thiamin needs met by the thiamin production of the rumen microflora. Once absorbed, thiamin is transported in the serum chiefly bound to albumin. Type I - the most common form, this type is found in fish, shellfish, ferns and some bacteria. It acts by displacing the pyrimidine methylene group with a nitrogenous base or SH-compound to eliminate the thiazole ring. Type II - found in certain bacteria, this type acts through the hydrolytic cleavage of the methylene-thiazole-N bond to yield pyrimidine and thiamin moieties. Both types of thiaminase require a cosubstrate - usually an amine or sulfahydryl-containing compound such as proline or cysteine. Once the thiamin molecule is cleaved by a thiaminase the body is incapable of restoring it. Thus, the ingestion of significant amounts of thiaminases can induce thiamin deficiency even though there may be a sufficient amount of thiamin in the diet. Many thiaminases are denatured by heat, but apparently vary in their heat stability. Subjecting thiaminases found in some types of raw fish and fish entrails to cooking or other heat treatment will render those thiaminases inactive enough to prevent thiamin deficiency in carnivores. The original inhabitants of Australia soaked thiaminase-rich nardoo in water for a time and cooked them into bread and soup before ingesting them, thus avoiding the thiamin deficiency symptoms presented by people who eat nardoo raw. Fern thiaminases may not be completely destroyed by cooking, so until it is clearly established which combinations of cooking time, cooking pressure and cooking temperature is needed to eliminate pteridophyte thaminase, caution should be exercised in consuming ferns as human food. Because they are unable to fully utilize the energy in their diet, thiamin-deficient non-ruminants will exhibit severe anorexia which will, of course, be accompanied by weight loss and weakness. Such animals will also typically show neurological disfunction to a greater or lesser degree including ataxia and convulsions. Some species, especially birds, will exihibit opisthotonus - a retraction of the head sometimes referred to as "star-gazing". Thiamin deficiency will also cause cardiac disfunction in some species. Symptoms of this include cardiac enlargement and a slowed heart rate. Further heart failure can lead to severe cases of edema. The following photo shows cardiac enlargement in a pig. 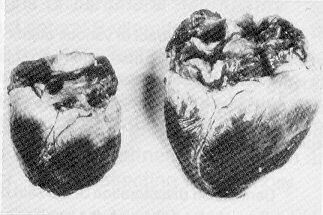 On the left is the heart of a normal pig, the heart on the right is of a thiamin-deficient pig. Dry beri-beri - usually without cardiac involvement, this form of the disease is typified by atrophy of the legs and peripheral neuritis. It occurs mainly in adults. Wet beri-beri - the primary sign of this form of the disease is cardiac enlargement and edema. Thiamin deficiency in ruminants manifests itself as polioencephalomalacia. Signs of polioencephalomalacia include disorientation and wandering, blindness and opishotonus or retraction of the head. The brain of infected animals becomes inflamed and edematous. Ruminants will also show symptoms as seen in other animals - anorexia, poor feed utilization and weakness. Normally ruminants are fairly resistant to thiamin deficiency since rumen microbes provide the animal with sufficient amounts of thiamin. However, the ingestion of thiaminases will lead to polioencephalomalacia. Additionally, young growing ruminants, especially cattle and sheep, fed high-grain diets are especially susceptable. Diets high in grains can encourage the growth of certain thiaminase-producing bacteria in the rumen. These bacteria, including Clostridium sporogenes and a few species of Bascillus can produce enough thiaminases to induce thiamin deficiency. In the spring - when bracken fern is one of the first plants to emerge and therefore potentially a major component of the pasture. In animals kept on very lush pastures that may select bracken fern for its fiber content. Bracken fern contamination in hay. In fields where plowing has exposed the rhizomes. Bracken fern used as bedding. Non-ruminants consuming significant amounts of bracken fern in their diet will exhibit signs of thiamin deficiency. Horses fed hay with greater than twenty percent bracken fern will begin to be symptomatic within a month. Horsetails are widespread in moist areas of the United States and Canada and contian significant thiamin activity. 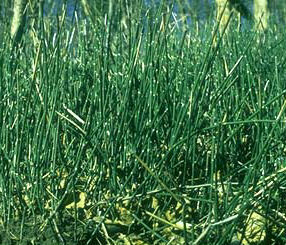 The most common instance of thiamase poisoning resulting from horsetails is the contamination of hay with horsetails. A horse consuming hay containing twenty percent or more of horsetail plants will show signs of thiamin deficiency in two to five weeks. Nardoo is an Australian fern that can contain thiaminase activity up to one hundred times that of bracken fern. Nardoo will often grow in areas that have recently flooded, and is responsible for a large number of cases of thiamin deficiency and death in sheep in Australia and New Zealand. Thiaminases are present in the viscera of certain raw fishes and shellfishes, especially carp. Humans, even sushi lovers, rarely eat enough raw fish in their diet to constitute a problem. However, thiaminase induced thiamin deficiency has been seen in mink and foxes fed large amounts of raw fish in their diet. Termed Chastek's paralysis, after the fox farmer who first documented the disease, thiamin deficiency in these animals follows the same path as outlined above. Another Austrialian fern, found mainly on the coast, rock fern also has a high level of thiaminase activity. Kochia, also termed summer cypress and fireweed grows mainly in desert regions of the south-western United States. Ruminants grazing on kochia have developed polioencephalomalacia, however it is unclear whether this effect is due to the presence of a thiaminase or a hepatotoxin which interferes with thiamin utilization. Infected animals also exhibit liver necrosis, which suggests a hepatotoxin as the main factor in kochia poisoning. If a thiaminase exists, it is probably not a dominant factor. As stated in the page on thiamin deficiency in ruminants, it is known that certain species of bacteria are capable of producinging thiaminases. Clostrridium sporogenes and a few species of Bascillus are thought to be the main culprits. If these species dominate in the rumen environment, thiamin deficiency can result. 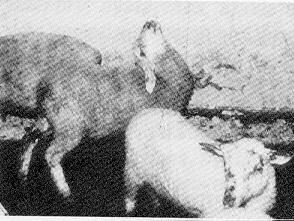 Feeding high grain diets favors the growth of these species, and young ruminants, age two to seven months, are at greatest risk. Animals suffering from thiamin deficiency due to the ingestion of thiaminases generally respond very well to treatment if caught early. Intra-muscular of injections of thiamin, and removing the source of the thiaminase from the animal's diet, are usually sufficient to bring around full recovery. Doses of 100-500 mg of thiamin for sheep and 200-500 mg for calves, depending on body weight are sufficient. The story of Australian explorers, or why you should cook your ferns. Okay, so legend has it, and so does Moorehead's book Cooper's Creek (1963), that a couple of Australian explorers, Robert Burke and Willliam Wills, died in 1861 from thiaminase poisoning. They were wandering around the Australian continent, doing what explorers do, and their supply of pork, which was their main source of thiamin, ran out. So what did these guys start feasting on? Nardoo, of course. Now, if they had watched the Aborigines they would have known that one does not eat nardoo without cooking it first. But, being typical explorers, and thus thinking that they were smarter than the indigenous people that had lived on the continent for thousands of years, Burke and Wills ate their nardoo raw. They began complaining in their journals of increasing weakness and starvation, but "not so much from absulute want of food" because, Wills wrote, "I have a good appetite and relish the nardoo much but it seems to give us no nutriment." What they were suffering from then, was thiamin deficiency. Coupling a low-thiamin diet with a large intake of thiaminases from the nardoo, Burke and Wills developed beri-beri. They complained not only of weakness, but of edema too, and sensitivity to cold. They died. * Canadian Poisonous Plants Information System.